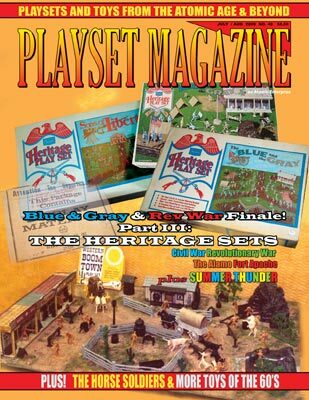 With this issue we put the finishing touch to not one but two of our most popular series: the Marx Battle of the Blue & Gray, and the Revolutionary War sets. To do that, we venture for the first time into the sets of the 1970's and the Marx Heritage sets. Here we find some surprises and some first-time ever published insights into this brilliant line featuring in some cases the very best the company had to offer. Ny this time, Charles Marx, nephew to Louis Marx (president of the company) and son of David Marx (head of sales) has replaced his mentor at the firm, Charles King. Charles was the head salesman and for more than a decade Charles had been studying the man, learning his tricks, fast thinking, and sales ability. Suddenly Charles finds himself at the "top of the heap" at the very same time Sears is dropping most playsets because they are considered too violent! "Playsets were my bread and butter," Charles recalls. "And Sears was on its way to becoming a minor account." Well, this could never happen on Charles' watch. 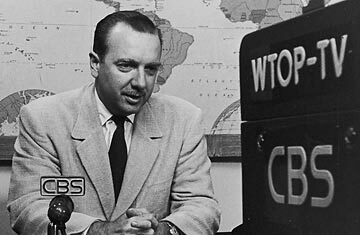 See how he saves the day and watch the surprises that come your way in "The Heritage Sets" -- and how world-famous newsman Walter Cronkite and even the White House is involved! and quite possibly one of our most popular columns, Kath's "My Side" with a huge civil War and Fort Apache displays! So as Mom would say, "Don't dare miss a single surprise in Issue 40 -- we'll see you there!"